Consumers and professionals are constantly reviewing businesses on websites like Yelp, Angie’s List, and even internal review websites like Glassdoor. But, in recent years, we’ve also seen the rise of Google Reviews, a local business directory that links consumers to brick-and-mortar businesses in their neighbourhood. These reviews usually have one to five stars and a short description of the individual’s experience. 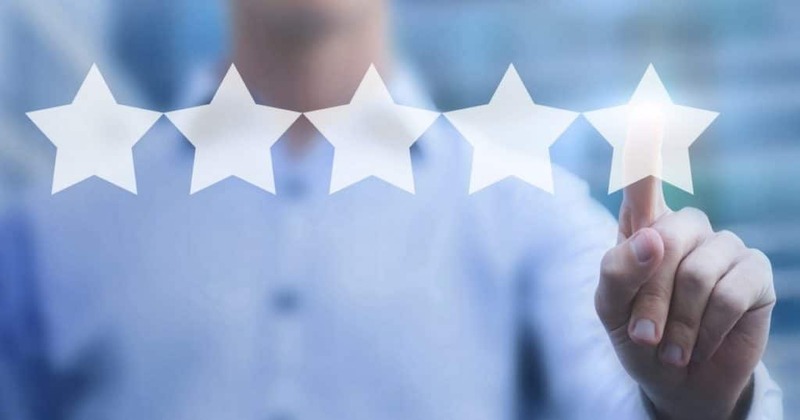 You can expect to see a lot of reviews relating to customer service, long wait times, or a product’s overall effectiveness. While 90% of consumers read online reviews before visiting a business, Google is also using them to rank websites in its search results. Find out how Google uses online reviews to rank different businesses based on customer preferences. Google wants to direct its users to great content and great businesses, so obviously, you want all those online reviews to be positive. While no one outside of Google knows exactly how its search algorithms actually work, many people in the industry have seen some companies take a nose dive in certain search rankings and, guess what, their online reviews were down right terrible, or they didn’t have any reviews at all. Google used to depend on established business review websites like Yelp and Angie’s List to see what consumers think of a particular business, but now Google has its own review listing service. While reviews on Yelp and Angie’s List can still make an impression on Google’s algorithm, more attention is being paid to what consumers are saying on Google Reviews. 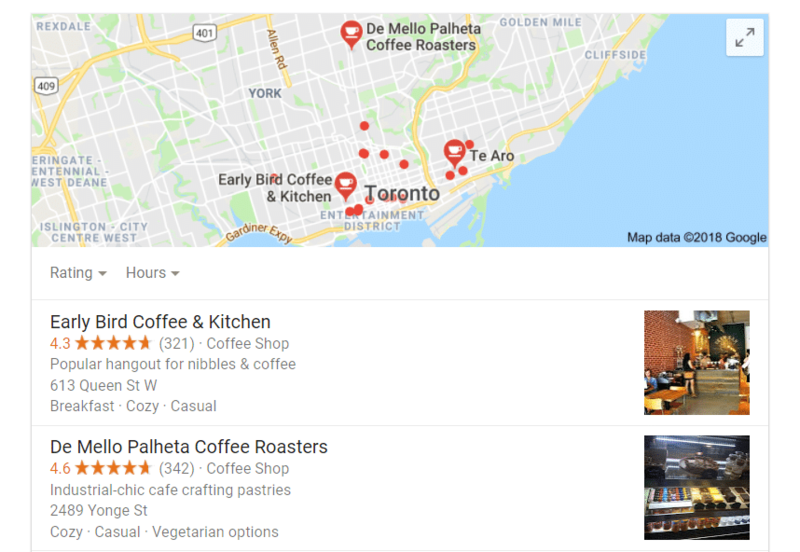 If you type in a certain keyword such as “Coffee in Toronto”, once you get past all the listicles, nearly all the top-ranking websites have stellar reviews on Google. They’ll either appear on the map or as regular search listings. And Google makes it easy to for consumers to quickly glance at a company’s reviews when they’re scrolling through listings on the map, so it’s important to get as many of those highly-coveted five-star ratings as possible. Remember that online reviews have been shown to impact 67.7% of purchasing decisions, so give consumers a reason to click on your website or visit your business in person. Business reviews don’t stop there. Google is also looking at the content on your company’s website for more information about its reputation. That includes any onsite reviews that your customers can leave about your business and any products or services you sell. This really comes in handy for ecommerce websites and digital companies that don’t have a brick-and-mortar store that customers can visit in person. Contact your web host and see if you have the option of setting up an onsite review feature. Every product page or service page can have hundreds of reviews at the bottom of the page. Google will scour through this information to learn more about what your company is all about. Those web crawlers need all the data they can get to properly categorize and rank your website. There’s a good chance that many of your customers will use certain valuable keywords when they’re reviewing your company. If a person likes or dislikes one of your goldfish art posters, Google will then know that your company sells goldfish art posters. It’s just that simple. It goes without saying that all these reviews can have a negative effect on your business if you’re not doing a good job meeting the needs of your consumers. While most SEO experts agree that having negative reviews is better than having zero reviews at all, mainly because Google wants as many consumers using its online reviews system as possible, it’s still important to have a positive reputation online. Businesses can lose up to 22% of their business when potential customers find just one negative article on the first page of their review page results. So, how are you going to improve all those online reviews? Customer service is the most important part of any online review. In fact, that’s the main reason people leave reviews in the first place. So, whether you’re responding to your customers on Twitter or spending hours on the phone trying to figure out why a customer’s package wasn’t delivered on time, make your customers feel that you care about them. Even if something goes wrong with one of your products or services, you need to be there to hear the customer out. Your customers want to be heard, so either they’re going to do it on the phone with a customer service rep or via an online review that everyone can see. If you respond to customer questions and complaints, your customers will be that much more likely to leave a positive review online. If some of your products are leaving your consumers frustrated and unhappy, it might be time to take them off the shelf or remove them from your e-commerce website. Even if you make a little bit of money off some of these products, they could permanently damage your company’s reputation. People will look through the reviews and see that you sell cheaply-made, lackluster products that don’t do a lick of good. Be proud of everything you sell, and your customers will reward you. Whether you’re helping customers checkout in person or online, you need to have a robust team in place to deal with all these customer interactions. It’s not just about having a dedicated customer service team in place, it’s also about having a reliable IT department that can fix issues with your website. From social media to the customer call center, make sure you have enough man power to run your business smoothly and create a positive customer experience. Business reviews can either have a positive or negative affect on your company’s SEO score. Google wants to connect its users with businesses in good standing with the public. Make sure you have a review platform up and running, whether it’s Yelp or a platform hosted on your own website. Focus on delivering quality customer service and your SEO score should improve as a result. Get in touch with Toronto SEO Expert Paul Teitelman to lead your business to organic success through SEO. He will assess your website and help you determine the best course of action for driving traffic and developing high ranking SEO content that will bring you solid results that your business can count on for more exposure and better sales.